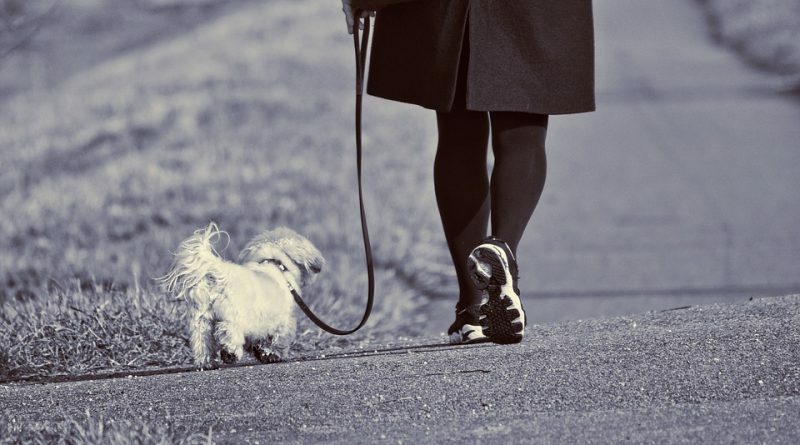 Ok ladies, a friend of mine suggested that we need to see some cute, waterproof shoes to wear when taking our dogs outside where ever we happen to park our RV. When it comes to shoes, I’m game. So, here is a variety for us to choose from! 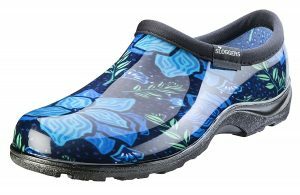 The Sloggers Garden Outfitters – Premium Garden Clog is a waterproof, durable, and highly-rated slip-on shoe. They come in a variety of solid colors for those who have more reserved tastes in color and pattern and are comfortable enough to wear all day around the RV with or without socks. Sloggers also has a recycling program for those old Sloggers you wear out. Just don’t leave them outside your RV. That lady who was asking you about your shoes just might have sticky fingers. These shoes are THAT good! The Sloggers Waterproof Rain and Garden Shoe is a highly-rated, durable, and comfortable shoe. There are MANY colors and patterns to choose from. Check sizing and reviews to decide whether to go up a half size to accommodate socks. 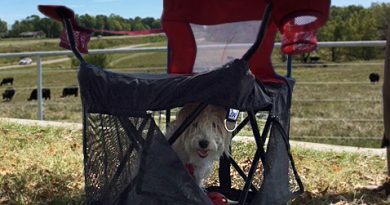 The sole has heavy-duty tread for those extra muddy days when your adventure dog still needs to head outside the RV to protect you from those pesky squirrels. 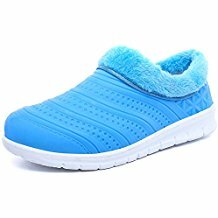 The EnllerviiD Women’s Waterproof Faux Fur House Slipper, for indoor and outdoor use, comes in three colors – blue, pink and red. The plastic upper and rubber sole make these waterproof and easy to clean as well as lightweight. They are an all-season shoe. Sizes are not standard US sizes, so measure carefully and use their sizing chart. You would be so disappointed to get your new shoes and they only fit your big toe. Now for those of you who like a little bling in your casual slip-on, waterproof, take-the-dog-out shoes, these are for you! Nothing says dog party like showing up to the daily, RV adventure dog walk in a pair of glittery shoes such as the Glitter Jelly Flat. These cute shoes come in four different colors and all have a bow on top. If you like to sparkle, then you will wear these shoes proudly! 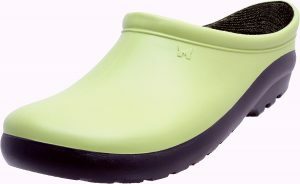 These Sintiz Women’s Quick-Dry Garden Clogs are an inexpensive version of a slip-on, waterproof shoe. If you’re on a budget (like many RVers are), these will be perfect for you. They come in four colors: gray, blue, pink and purple. The floral pattern is also quite nice and not garish like some other, lesser expensive clogs I found. There are also some other nice patterns available from Sintiz. 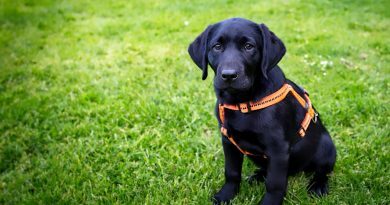 We don’t want to look tacky while we’re taking the dog out to do it’s business now, do we? Ok, now there has to be at least some of you out there who would wear these! 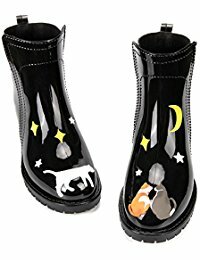 The KicKic Women’s Waterproof Rain Booties are perfect for RV travel in the spring and fall when it’s raining cats and dogs. See what I did there? Anyway, I just thought I would add these because they fit the bill for cute and waterproof! When I moved into my RV a few years ago, I had to give up my shoe collection. I gave up quite a few pairs, but still held onto my nasty clogs for taking the dog outside. Now that I have seen these other options, I think it’s time to retire the old clogs. See you down the road, ladies! I’ll be the one wearing the cute, new shoes. Special thanks to Jaime Sichler of Away We Winnebago for this article idea! 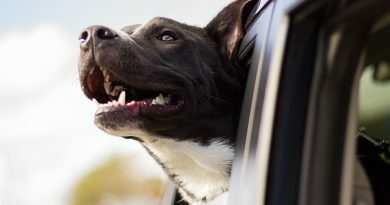 Please share your cute, take-the-dog-out-of-the-RV shoes! Show us some pictures in the comments below, or submit a story we can share in our community story post! I might have to try the rain & garden show! Too cute and practical! LOVE the name of your website! I might have to try the rain & garden show! Too cute and practical!